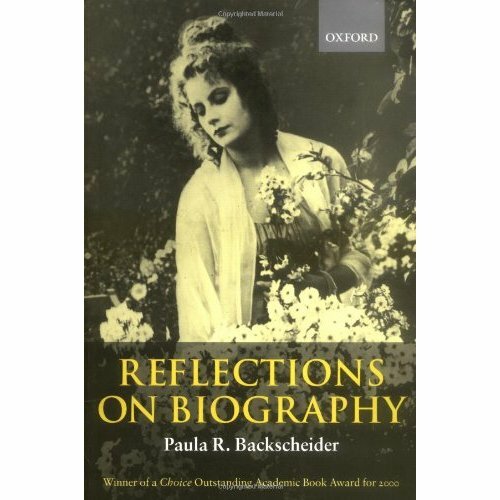 In her preface, Paula Backscheider notes with frustration that reviewers of biographies often retell the subject’s life gleaned from the very biography that they are reviewing without engaging in questions of selection, organization or presentation. These questions are the focus of this book. Because books that have won commercial and critical acclaim form the nucleus of her sample, academic books are largely excluded. In fact, she is rather dismissive of academic biographies with their author’s emphasis on documentary fact, their fear of ‘making things up’ and what she describes as a degree of distrust for average readers. This is rather curious, given that she herself is Pepperell-Philpott Eminent Scholar at Auburn University in Alabama. Compared with the whole-life biographies that she deals with in her survey, many ‘academic’ biographies deal with only a short period of the subject’s life, and often take a ‘life and times’ approach. She reviews the opening 100 pages in a number of biographies to note the techniques that are used. An improbable number begin with a reference to the weather; the most common opening lines are personal remarks or anecdotes; next frequent is a reference to the biographer’s identification with the subject. Less than half of these point out the great challenge their biographical subjects pose to the act of biography, while others make pre-emptive strikes on received opinions or mount arguments over the value of the subject’s life to the reader. The opening chapters often give as exciting a description as possible of the family and several begin with a strong description of the place with which the family is associated. In Chapter 2 ‘Living with the Subject’ she explores why biographers choose the subjects they do and addresses the nightmare, middle-of-the-night questions that biographers ask themselves. Questions about their own expertise to even embark on the task, the availability and accessibility of material, the originality that is open to them and possible competition from other biographers working on the same topic. She points out that the great questions of biography are the essential questions about human experience in the world. The second part of the book ‘Expansions’ is more a series of mini-essays on the state of the field. There is no particular unity in the way that they appear in the book. In Chapter 5 she looks at the challenges in writing feminist biography, and the way that feminism has affected the way that biographies of male subjects have been written as well. In Chapter 6 she identifies a number of recent and not-so-recent biographies that ‘push the envelope’- for example, Mark Kurlansky’s Cod or Jack Miles’ God: A Biography. In Chapter 7 she compares two groups of biographers who dominate the field of biography today: The British Professionals and African-American Academics. I must admit that I don’t think that I’ve read any African-American Academics, so most of this section went over my head. But I have read The British Professionals (think Peter Ackroyd, Michael Holroyd, Victoria Glendinning, Richard Ellman and my favourite, Richard Holmes). The British Professionals, she suggests, ‘push the envelope’ by mingling fact and authorial licence. They undertake formidable research, immersing themselves in the works of their subjects (because they do tend to write about writers) and they painstakingly accrete facts and quotations to create a blend of their own writing style and that of their subject – an approach that detractors might call ‘ventriloquism’ or ‘mimicry’. Their voices are warm, but authoritative. They are often self-conscious, engaged with ‘biography’ itself as an intellectual practice as well as the subject’s life. As an aside, I note in a review in this weekend’s paper that Ackroyd, surely the most prolific of the lot, has eschewed references entirely in his most recent book on Chaplin. It has an exhaustive bibliography, but no footnotes. That’s a very confident sense of mastery. The African-American Academics, she claims, have less of this certainty. In contrast to the British Biographers’ masterfully understated and confident invoking of Britishness, the African-American biographers see history as a major complication in Black biography (p. 210). They know that they are writing about an individual as a member of a people, a concept that links identity and history. They are academics, steeped in cultural studies and all its jargon, but they fear summaries and tightly unified portraits. (p. 219). This book received only lukewarm reviews amongst the academic journals. The reviewers have taken Backscheider at her word and focussed on the rather untidy structure of the second part of the book in particular, and bridled at the ‘teacherliness’ of the first part. For myself, neither of these things worried me. At this stage of my own work, the writing of biography (nasty, academic biography that it is! in her view) is uppermost, and I took the second part of the book to be a collection of separate essays on aspects of the craft. Very interesting I found them, too.